We know that we’ve been doing loads on Kickstarter projects over the past few months but it’s a place where a lot of new ideas are emerging at the moment, including Bitlock’s Bluetooth keyless bike lock. The inventors claim this is a world first and we’ve certainly not heard of any others. You just walk up to your locked bike and press the button on the BitLock, BitLock senses that you’ve come within 3ft (1 metre) of your bike with your phone and it’ll unlock. The idea is that you don’t need to carry a normal key with you, just your phone – and the chances are that you have your phone on you most of the time anyway. BitLock also records where you’ve locked your bike on your phone GPS so you’ll always be able to find it again. 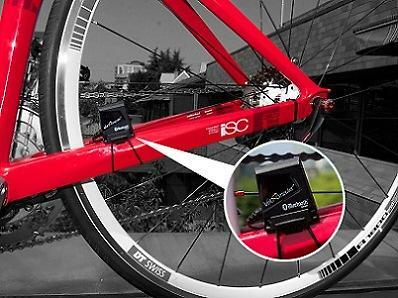 BitLock say you can lock/unlock your bike more than 10,000 times on a single replaceable battery. Currently these phones are supported: iPhone 4S or 5, 5C and 5S, as well as Samsung Galaxy S3, S4, Note 2, 3, HTC One, EVO - Motorola Moto X, Google Nexus 4 and 5 handsets running Android 4.3 (Jelly Bean) or later. Well, they’ve thought of that. You also get a 16-digit code that’ll open the lock that you can store somewhere safe in case of emergency. Anyway, we think it sounds interesting. You can pre-order a BitLock on Kickstarter now. You’ll have to pledge $99 plus $35 for shipping outside the US. That’s about £84 all in. 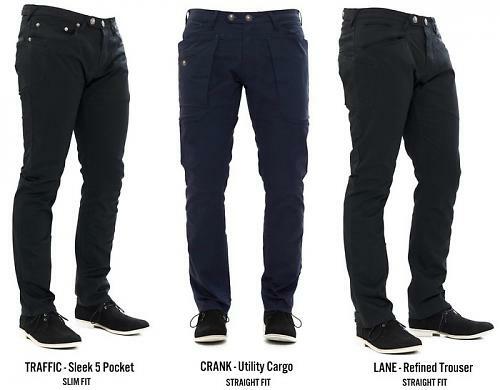 Osloh jeans, trousers and shorts come with a bit of stretch thanks to spandex in the cotton, they come with a quilted chamois reinforced crotch and seat, and they have a water resistant and antibacterial coating. There are loads of neat little details like reinforcement on the right (chainside) leg and clever pockets designed so things don’t fall out as you pedal. You need to pledge $68 (£43) for the shorts, and $98 (£61) or more for the jeans/trousers, plus an extra $15 (£9) for shipping outside the US. Canada's SoundOfMotion will soon be launching an Android version of their VeloComputer sensor system which they claim allows you to measure spot speed, acceleration, incline and, ultimately, power. The main sensor body attaches to the chainstay while the small magnetic field sensor, connected by wire, is positioned next to the hub. It transmits data via Bluetooth to the VeloComputer smartphone app. VeloComputer 1° Precision Bluetooth Smart Sensor from VeloComputer on Vimeo. Your phone can record all the data from the sensor in CSV files, and you can then transfer them to something like Garmin Connect, Training Peaks or Strava. The app is already available for iOS and VeloComputer now say that it’s coming to Android shortly. The Bluetooth 4.0 Smart Sensor and VeloComputer mobile app will ship in November and costs $79 if you pre-order – $149 if you don’t. We’d love to compare the power results from this system to those from PowerTap or Garmin Vector, for example. For more info go to soundofmotion.com. Ever more bike brands are offering you the chance to spec your own bike exactly how you want it, and Wilier provide that service across the range. Of course, you’ve always been able to buy a framesets and build it up yourself – or have a bike shop build it for you – but here the manufacturer will do it instead. With Wilier, you just go to www.wilierbikes.co.uk and check out the price list for the frame, wheels, groupset and chainset option you want. 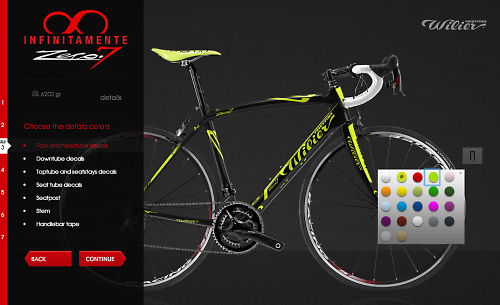 You place your order through your local Wilier dealer and pay them a 20% deposit. Then your bike will be built to your specification in northern Italy, just outside Venice, and delivered to your chosen retailer, usually in 6-8 weeks. Prices for a full carbon, custom-built bike start at £2,149 for the GTR with Campag Athena groupset, RSport wheels and FSA Gossamer Cranks. The top-level Zero 7 has its own online custom configurator. You go to the website and follow the instructions to choose the model, frame colour, decal colour (you can have different decals in different colours), wheels, groupset (options from Shimano, SRAM and Campagnolo) and saddle. For more info mail info@atb-sales.co.uk or call 01424 753566. Zipp are introducing a limited edition Super-9 Carbon Clincher Disc wheel featuring an innovative design applied with their new Impress Technology, but it’ll only be available in the US. Zipp say that Impress Technology provides limitless possibilities for lightweight wheel graphics through direct printing, and that it is durable. Impress Technology is already in use, with discs having been delivered to the Zipp-supported Omega Pharma – Quick-Step Cycling Team and Team Saxo-Tinkoff for the Tour de France earlier in the year. 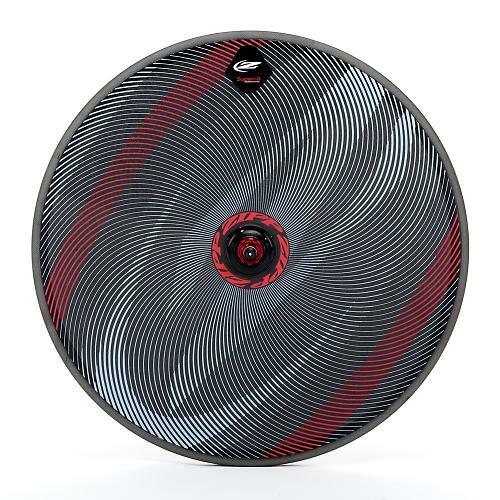 The Super-9 Carbon Clincher Disc (1,155g claimed weight) will be available in this limited edition design from late November but only in the US at $2,500. 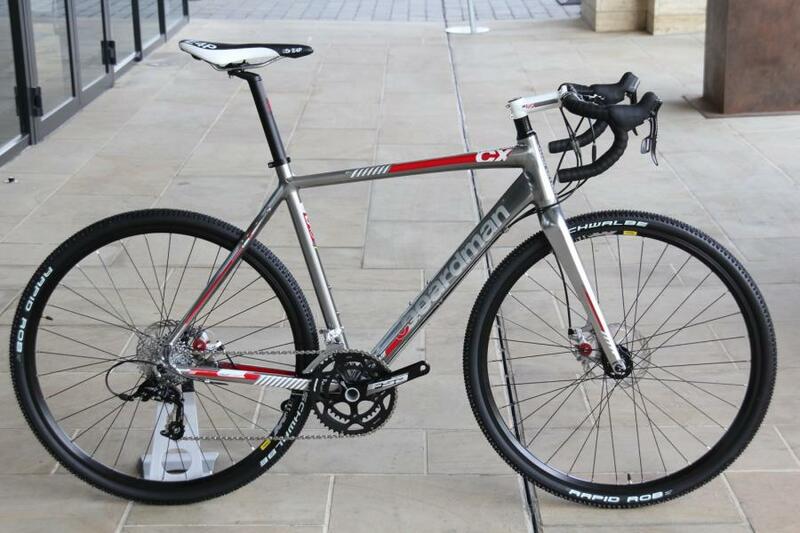 Boardman Bikes have identified a minor manufacturing fault on a delivery of their new Boardman 2014 CX Team bikes. They say that it is a cosmetic issue and not a safety risk, and that it is specific to the CX Team frame and does not affect the Boardman 2014 Performance Series. Boardman have already ordered replacement stock but there will be some shortage of availability of the CX Team until the new stock arrives. They have also removed the CX Team from sale on their website to help manage demand. If you’ve bought a CX Team, you can continue riding it for now, and Boardman will contact you to arrange a replacement when they have new stock… which all sounds very reasonable to us. 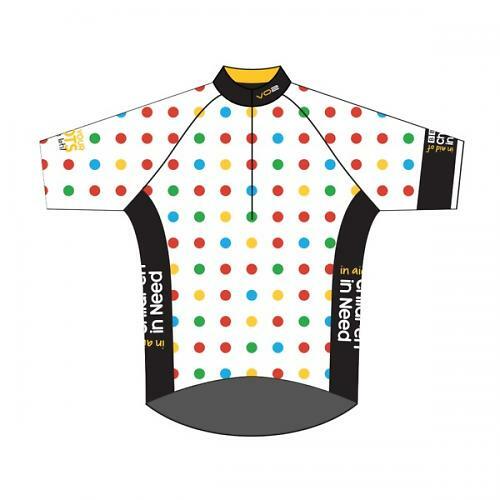 VO2 Sportswear has released a limited edition Children In Need Jersey that is fully accredited by the Children in Need appeal. To achieve this they are selling the jersey for £44.99 and for each jersey sold they will be donating £15 to the cause. The inspiration for the cycling jerseys is rooted in VO2’s passion for local charities, particularly regarding the fantastic youth work that extends throughout Bolton and its surrounding areas. The polka dot jersey – now available on the VO2 Sportswear Store – is inspired by the Tour de France’s King of the Mountains jersey. The children’s cycling jersey is a short-sleeve technical jersey, made from VO2’s exclusive moisture management fabric. It’s available in both adult and kids’ sizes. “Children in Need supports The Bolton Lads and Girls Club, a local children’s charity that we are particularly passionate for,” said VO2’s managing director, Matt Tomkin. Place your order at the VO2 website. 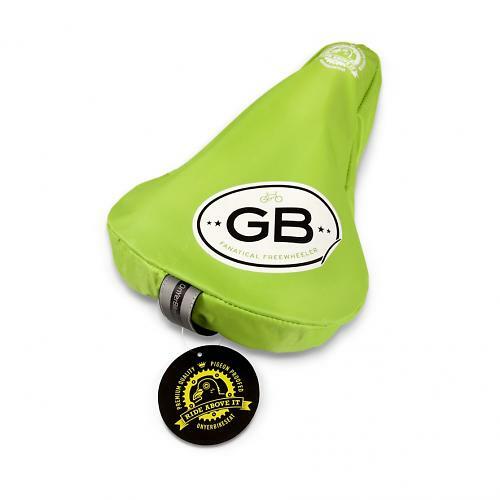 Want a saddle cover for the winter? On Yer Bike Seat do a whole bunch of different designs made from Ripstock nylon with a PVC coating. You get a hi vis loop label on the back and they cost £9.99 a go. You can buy direct from www.onyerbikeseat.com. 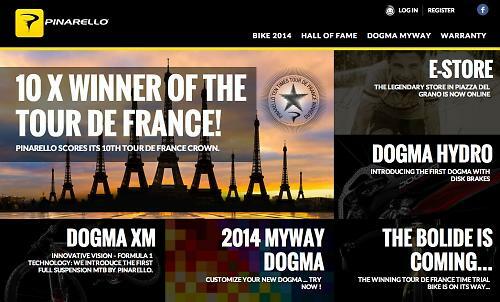 Pinarello have just launched their new website and... um, well, that's about it, really. It has all their bikes on and everything - you know, like websites do - including the Bolide TT bike as used by Team Sky this year, and the new Dogma Hydro. Visit www.pinarello.com. Howies have a whole bunch of new clothing on sale for the winter, including merino underwear. 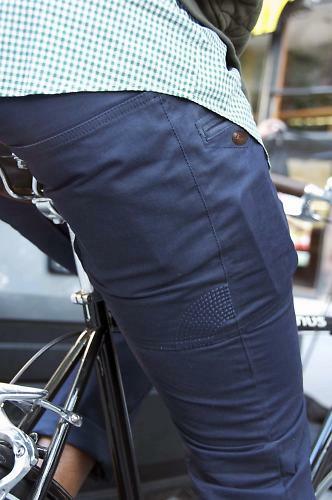 It’s not bike specific, but you can get Penn Merino Boxer Shorts for £20 that might be a good option for riding around town without feeling too sweaty. We’ve not used them – there’s a bit of guesswork involved here – but they do have flatlocked seams, which is encouraging. They also do Walter Merino Long Johns for £39. 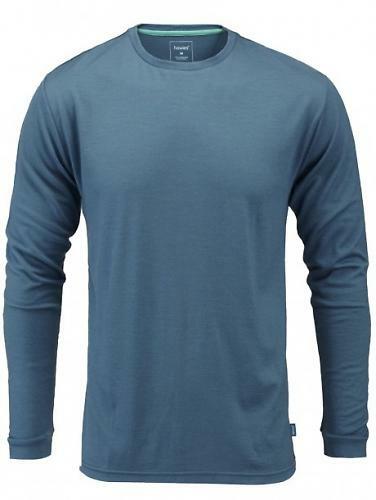 Howies’ Classic Merino Base Layer is £55. Go to www.howies.co.uk for the full range.